The Dougherty Arts Center class starts April 11th! Classes at Laguna Gloria, Clayways, and the Dougherty will be registering early December. I will have one or more ceramics classes at each of these venues in the New Year, so look for more information soon. Better yet, get in touch with me via the Contact page! 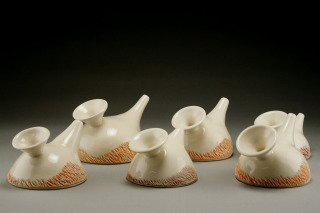 There are many great ceramics classes starting this July to have fun out of the heat. If you been wanting to try a clay class or get back into it after awhile, I have some great classes lined up. For Spring, the Dougherty Arts Center is the place, Mondays 12-3pm for 6 weeks starting April 13th. "Classic Clay" will include an intro to timeless hand building techniques. Call (512) 974-4000 to register. In Summer this class will move to Saturday mornings! Summer registration at The Art School at Laguna Gloria has also begun. My time slot will move to Wednesday nights only for the two summer sessions (then probably back to Thursdays in fall). The Art School at Laguna Gloria: Thursdays 1-4 or 6-9pm. See their websites for more info or check my Links page. Happy Holidays! I have new work showing at the 2014 Blue Genie Art Bazaar at Marchesa Hall, everyday 10am-10pm until Xmas eve (10-6pm that day). The show began on Black Friday and has already been very successful, yet there are still many fabulous pieces available! I'm introducing new workshops at the DAC in Austin this summer. Coming very soon is "Saucy Pouring Pots" on Monday 23 June. This one-day hands-on workshop will offer both hand building and wheel throwing possibilities. At $60 for a full day, it's a great way to squeeze in some quality clay time between summer travels. July 21st is "Building with Original Textures" and more to come. Please visit my Contact page to get on my e-mailing list. For the month of May and continuing into June I have new work exhibiting at 18 Hands Gallery in Houston TX. 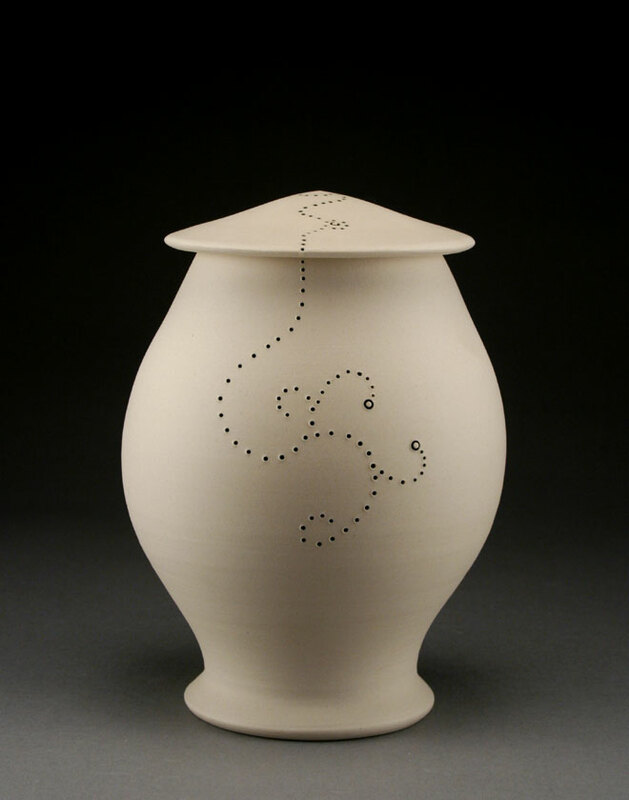 This gallery shows fantastic ceramics artists from all over the country as well as some of us Texans. 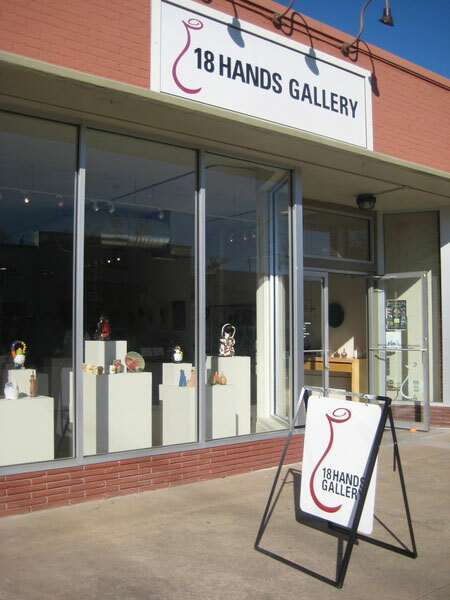 If you're ever in Houston, you'll be surprised at the high level of clay art and their creative gallery space. Flying into or out of Austin between now and mid-May? Near Gate 11 just to the right of Bookpeople is a glass pylon case with a handful of artwork from yours truly. I am in one of the ten cases dedicated for three months to an exhibition of current work by Austin artists. The cases are stunning and the ABIA's gallery coordinator has done an excellent job of curating an interesting group of artists. The goal of this hands-on workshop is to learn fun and interesting ways to incorporate your own unique textured surface into hand-built vessels. Students need to bring a few tactile objects (example: shells, kitchen utensils, random hardware) to create repeated texture into clay, which we will build into pots using variations on traditional techniques. Your favorite texture will become a personal tool as we create clay stamps that can be fired and used again and again. We will bisque fire your work for pick-up if you are not a current DAC student; current DAC students are welcome to glaze their work in their class. This workshop will meet for six hours with a scheduled lunch. Limit 12 students. Copyright © 2010-2019, Jennifer Hill Ceramics.